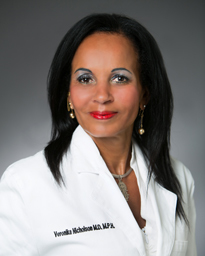 Veronika Nicholson, MD, is an internal medicine physician treating patients 6 months of age and older. After completing her Bachelor of Science in Microbiology at the University of Florida in Gainesville, Dr. Nicholson earned her medical degree at Howard University College of Medicine in Washington, D.C. She completed her internship and residency at McGovern Medical School at The University of Texas Health Science Center at Houston (UTHealth) and later completed her fellowship in infectious diseases at The University of Texas MD Anderson Cancer Center. Board certified in internal medicine and pediatrics, Dr. Nicholson treats patients for non-life-threatening injuries and illnesses, including allergic reactions, minor fractures and more. She is also fluent in German. In her spare time, Dr. Nicholson enjoys bicycling and volunteering in other countries where medical care is limited. Dr. Nicholson practices at Memorial Hermann Urgent Care Washington Avenue.